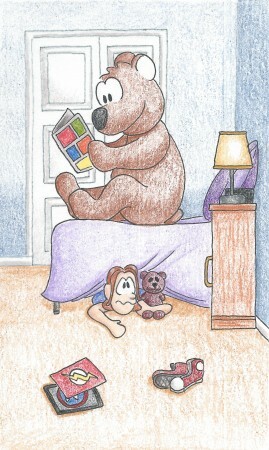 The worst part: the bear is probably creasing those comic book pages. How would the bear end up in there? How could it get so lost? And why despair this thing so rare? I was prepared for bears that scared. I checked beneath my bed. could help me rest my head. was drawing near, I’d think. There never could be bears in there. Oh what a strange concern. Love this poem! It’s so rhythmic and entertaining. Thank you! I had fun writing this one, though I didn’t start until nearly midnight.